The Certified Aging in Place Specialist program is designed to teach professionals, such as home builders and remodelers, how to best serve customers over the age of 50 in their communities. The training includes modules on customer service, business management and specific home remodeling and modifications for older adults. These skills help us create homes for older people that will help keep them healthy and happy later in life. 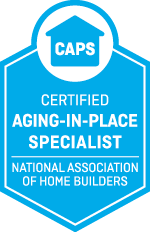 The Certified Aging in Place Specialist (CAPS) designation is from the National Association of Home Builders (NAHB) Remodelors™ Council. Participants in the program learn the basics of customer service skills for older adults. As well as, the technical and business training on how best serve them. The NAHB trains people how to best serve the needs of older adults. They are one of the few organizations that do. When you work with CAPS professional, you’re working with someone who sought specific training to help them serve you better. 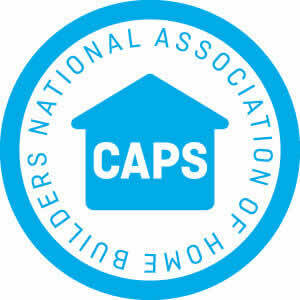 The Certified Aging in Place Specialist (CAPS) designation shows that a person has been trained by the NAHB to help older adults live in their homes safely as they age. CAPS professionals use Universal Design principles to design a home that will suit your lifestyle now and later. CAPS professionals have been taught the most common home remodeling and modifications to create homes that are more accessible and easier to live in. Safe Living Solutions has two CAPS certified staff on our team to help you get the exact home you need.